The recipients will be honored during SSPI’s 5th annual Future Leaders Dinner on October 12 at The Princeton Club in midtown Manhattan. The Future Leaders Dinner begins at 6:00 p.m. (ET) with a cocktail reception. 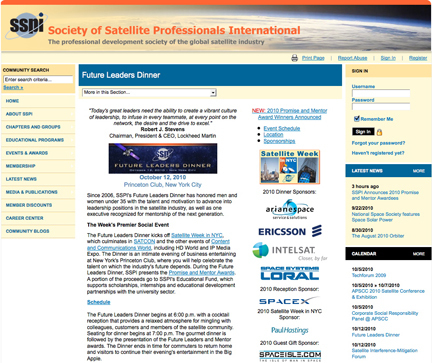 A portion of the proceeds from the banquet and awards ceremony goes to SSPI’s educational fund for scholarship and intern grants for students seeking careers in the satellite industry. In addition to the four honorees, SSPI makes honorable mention of three additional young professionals: Lt. Sean Zabriskie, Manager, HEO Payload Integration, Launch and Operations, SBIRS Squadron, Space and Missiles Systems Center, United States Air Force; Michael Stauder, Teleport Technician, Intelsat Kommunikations GmbH; and John Huddle, Senior Product Manager, Media Services, Intelsat Singapore PTE Ltd. The Future Leaders Dinner is made possible by the financial support of Arianespace, Ericsson, Intelsat, Space Systems/Loral, SpaceX, PaulHastings and SpaceIsle.